If by some chance you have not been paying attention, Sony was in the news a lot the past several days, but not because of anything mobile related. It looks like Sony Entertainment was the target and victim of an extremely effective hack, so far attributed to the North Koreans. DPRK makes the news here occasionally when something related to mobile comes along, whether it is a copy of a mobile operating system for a tablet with no internet access, or a fancy new smartphone that is a copy of a cheap-even-by-Chinese-standards technology, or even the existence of mobile service itself given the country has trouble keeping the lights on. It turns out there may be quite a bit we can attribute to Kim Jong Un, like bigger iPhones, and the fact that the original cast of the first Star Wars trilogy will be part of Episode VII. While Sony was making waves bowing to demands from the hermit kingdom, other news was made this week too, with the introduction of the new (old) BlackBerry Classic. BlackBerry made a big deal catering to the ultra-faithful BlackBerry user, all the way down to sub-3.5-inch screen, full QWERTY keyboard, and three-generation-old Qualcomm Snapdragon CPU to power the whole shebang. Of course, even with specs like that, it is a space shuttle compared to what is on the shelf in the store in Pyongyang. O, thank you dear leader. He is a mass murderer!! Wish one day he would be trial as such. this is what happens when you put a young murderous idiot in charge of a country and let him do whatever he wants. His uncle needs to bend him over a knee and spank him... oh wait.. he murdered that uncle... crap. Who's got the nuke codes? Oh look, a Joy of Tech comic that manages to shoehorn in an Apple reference. Color me shocked. Is it just me or does Kim look like special needs in the final panel? 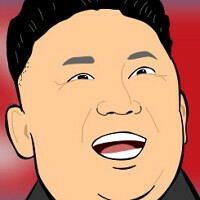 this kim guy is no different from alot of powers that be in the U.S.law/governent...and speaking of hacking, the U.S. government is hacking different countries, organizations, and maybe you for all we know this sony news is just another day in the hacking/espionage war that goes on all over the world. It was a competitor of Sony Pictures that had them hacked. Only sheeple think it was North Korea. phonearena, you are offending the GREAT LEADER. prepare to be hacked! better secure those logins and SSS details now.